For years on How I Met Your Mother, Ted (Josh Radner), Marshall (Jason Segel), Robin (Cobie Smulders), Barney (Neil Patrick Harris) and Lily (Alyson Hannigan) tore up our TV screens, earning laughs from Halloween parties, slap bets and all manner of relationship-oriented plotlines. The gang often delved into more poignant territory, too, asking its fans to invest in serious plotlines, including family deaths and other personal issues. The cast’s chemistry and the show’s willingness to delve into tougher territory were the charismatic ingredients that made How I Met Your Mother such a lasting series. Now, fans can own the whole series in a nicely packaged DVD set that will look handsome on any shelf. 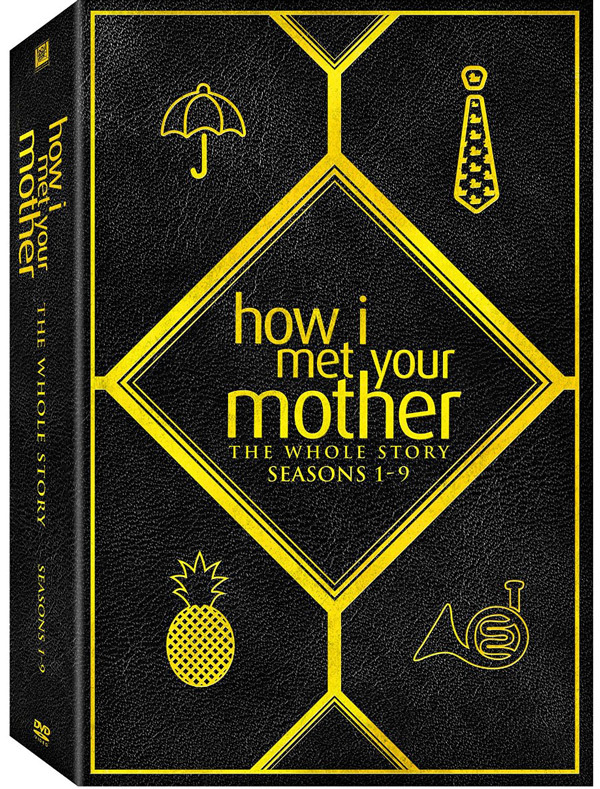 This week, Twentieth Century Fox Home Entertainment released the How I Met Your Mother: The Whole Story set. 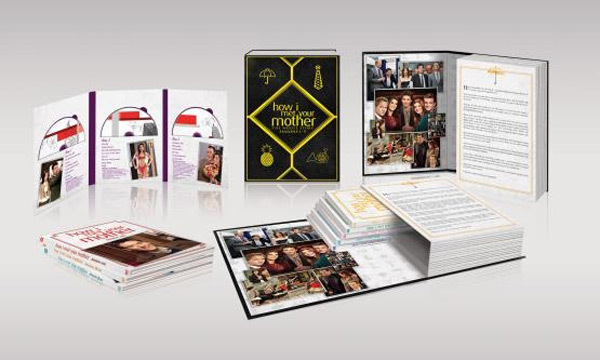 The DVD release encompasses the nine seasons the CBS comedy played out on air, as well as a bonus disc filled with several hours of extras. We take a look at the pros and cons, below. Let’s take a look at the packaging, first. The set was put together to look like Barney’s “Playbook.” The Whole Story opens like a storybook, with photos and a message introducing fans to Carter Bays and Craig Thomas’ series on the inside. Each of the seasons gets their own slim packaging, and bonus features are available with each season. If I had one complaint about the packaging, it’s that it is difficult to maneuver the seasons in and out of the playbook. The slim packaging is also kind of flimsy and one of the packages ripped a little when a disc got stuck to the glue holding the set together. Still, it’s a cute way to contain the series, if you can get over the minor inconveniences. Which leads us to the bonus features. Season 9 offers a bonus disc of The Whole Story exclusives. Some of these have received releases or mentions over the last several weeks. “The Secret of the Pineapple Scene Revealed” was actually brought forth by Buzzfeed a few days ago, and other stories from the extras have been circling the internet for the last few days. Extras are not always the foundation of a good set, but with the fandom that How I Met Your Mother accomplished over its nine seasons, there’s plenty for fans to smile about, here. I particularly loved the “All out of Spoilers: A Look Back at How I Met Your Mother feature. The cast and crew members all pop up to talk about all of the little moments that made How I Met Your Mother happen. It’s chock full of stories, including how Harris really wanted to play Barney and had a wild read-through, even doing a somersault during his interview. Then, there’s the one about how Carl was signed on as HIMYM’s resident bartender. Apparently, Joe Nieves showed up to play a cop on the first day on set, not realizing his character had been written out. The guy was even outfitted and stuck around for hours not realizing he was no longer needed on set. Since he was around, the crew signed him on to play Carl, and he ended up nabbing a regular gig instead of a one-off guest spot. It is gems like these that make the extras memorable. The brand new bonus features include a table read of the final episode, which is about as emotional as you’d expect and a couple bonus features, “How We Filmed The Kids,” “The Mosby Kids: 8 Years on the Couch,” looking at the scenes shot by the two Mosby kids (David Henrie, Lyndsy Fonseca) way back in 2006. Which leads us into the Season 9 alternate ending, an ending which looks back at HIMYM’s numerous years on screen and is far less of a downer than the ending fans got when the finale episode aired on CBS last spring. You can order How I Met Your Mother: The Whole Story over at Amazon. Additionally, you can take a look at a few more of this week's releases, here.